I was excited, I was going to be living in Rio; everyone on the bus was also excited. Actually if truth be told most of the people on the bus were well on there way to being legless. We were a few hours out of Rio and everyone was in the pre-carnival party mood. There’s nothing like lots of alcohol and a boring bus ride to bring out the party in people. Looking back I can’t help thinking that maybe this was some kind of liver bashing workout for living in Rio and the week ahead. Maybe I should have headed to Iguazu falls, it would have probably been the healthier option! Let me rewind for a second to put this all into context. 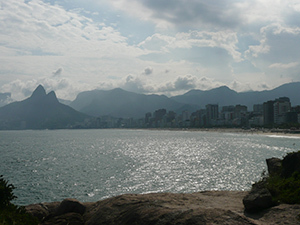 Like all good ideas my decision to start living in Rio was a spare of the moment thing. I was bored; Buenos Aires was emptying out as the heat of the summer pushed people from their homes towards the beaches of the South Atlantic. I on the other hand had other ideas; I was looking north to greener pastures and samba music. Two weeks before carnival started I half heartedly searched the Internet for cheap accommodation and chanced upon a nice women renting a room in her house. She was offering a room for a month for the same price that most people were charging for a week which made he idea of living in Rio affordable(Carnival time is a money maker for hotel owners and apartment leasers and prices increase two or three fold as hordes of tourists enter the city for a good time). Anyways, I digress. 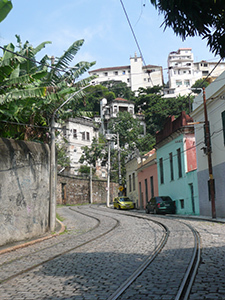 One week after arriving in Rio I left my temporary home on the hill with the tram to find the Carnival. I was heading off to see the world famous Rio Carnival I told myself, this was why I had decided to start living in Rio; thirteen hours later I woke up with a hazy recollection of the previous days events and a bad hangover. I repeated the process on the second day with much the same results, by the third day I had completely given up on any attempt to find this elusive carnival. The thing about Rio Carnival, is that there are street parties everywhere, while the actual carnival parade is small (but clearly a very central part of these whole celebrations). So as I headed to find the carnival, I’d find parties, lots of them. I’d be walking down a completely abandoned post apocalyptic looking street, turn a corner and I wouldn’t be able to move because of the crush of people.